I've recently discovered Ape Snacks - the producers of a range of deliciously crisp, flavoursome and healthy coconut snacks. 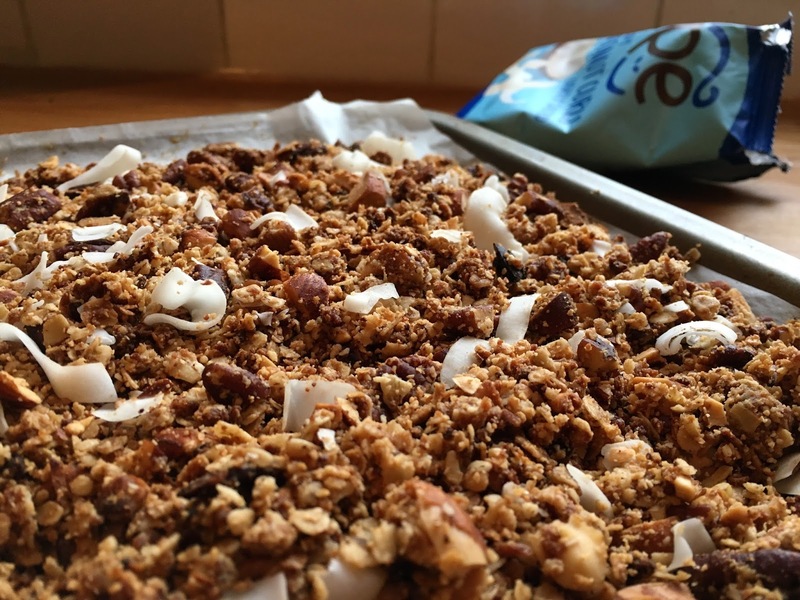 Whilst their products make brilliant mid morning / afternoon snacks, I wanted to find a way of baking with them too and so developed this protein packed granola recipe. The coconut swirls give the granola extra sweet and saltiness, and also a delicious crunch. The granola keeps really well for a few weeks and makes a fantastic gift for friends and family. Begin by preheating your oven to 180 degrees. In a small saucepan heat the coconut oil, honey and peanut butter over a low heat until the peanut butter has broken down. In a large mixing bowl, mix together all in the almonds, pecans, oats, vanilla and salt. Pour the honey liquid over and stir well until everything is well combined. Pour onto a lined baking tray and bake for 15 minutes, stirring the granola every 5 minutes to ensure it gets evenly coloured. Remove from the oven and gently stir in the coconut curls. Enjoy!